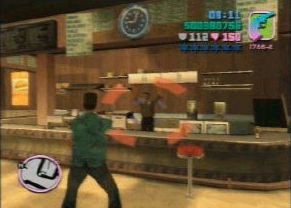 There are 15 stores throughout Vice City, which are easy pickings if you want a little extra cash. All you have to do is walk in, point your gun, take the money and walk out. air, and start to give you money from the till. wanted level will raise by one star. instant wanted level of two. A robbery will only count officially if you gain at least one bundle of cash from it. Running in, pointing a gun and quickly running out won't work. The 15 robberies count towards you 100% completion of the game.